Thousands of protesters took to the streets across the United States on Saturday for the second annual Women’s March against US President Donald Trump, to coincide with the one-year anniversary of his inauguration. The rallies aim to translate female activism into gains in a broad swathe of state and federal elections later in the year. The biggest demonstrations were taking place in Washington, New York, Los Angeles and Chicago — but there were also marches in about 250 other cities and towns across the country. Support was also coming from abroad, with rallies in Britain, Italy and Japan among other countries. Thousands of people gathered in Chicago’s Grant Park. Fawzia Mirza drew cheers from the crowd as she kicked off the event with a reference to the government shutdown, which began hours earlier. Also high on the list of complaints with the US president are multiple allegations of predatory sexual behavior at a time when there is a growing backlash against such behavior, as illustrated by the growing social media phenomena known as #MeToo and #TimesUp. Hollywood actors Eva Longoria, Natalie Portman, Viola Davis, Alfre Woodard, Scarlett Johansson, Constance Wu, Adam Scott and Rob Reiner addressed a crowd of hundreds of thousands in Los Angeles. Jane Fonda joined the march in Park City, Utah, where the annual Sundance Film Festival is taking place. 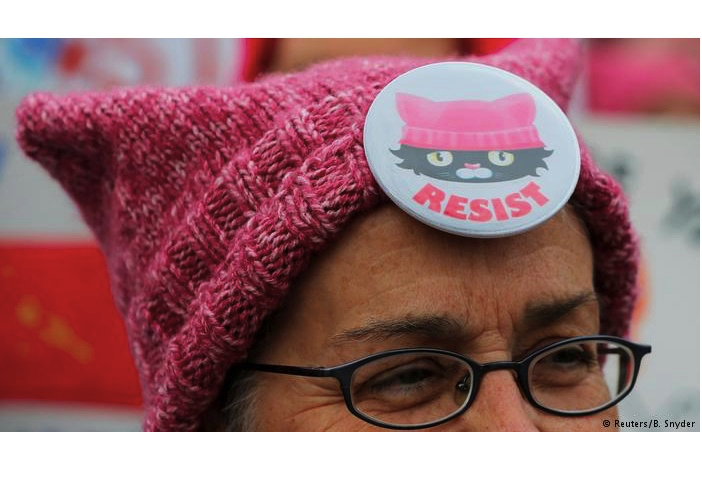 Trump tweeted later in the day that it was a “perfect day” for women to march to celebrate the “economic success and wealth creation” that’s happened during his first year in office. Several dozen activists demonstrating in Rome in protest were joined by the Italian actress and director Asia Argento, who alleged in October she had been sexually assaulted by Hollywood producer Harvey Weinstein in the 1990s.